Men's Harnesses, Armbands, and Cockstraps. Welcome to RogueDenim.com. Rogue Denim offers unique denim harnesses, armbands, and cockstraps. This is a one-man operation with each article hand-made in the Rogue Valley of Southern Oregon. The denim straps on all the products are 100% cotton and four layers thick. Currently there are two styles of harnesses offered in three colors. 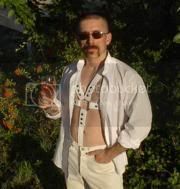 There is a half denim harness and a full denim harness with the abdominal strap attached to a denim cockstrap. The men's denim harness - a great alternative to a leather harness! The three choices of blue, white, and black denim offer a different look for a variety of occasions. Harnesses don't have to be just for leather bars anymore! Wear one to a cowboy bar, white party, or just hangin' around the house. The cotton denim makes it soft and comfortable. The denim straps are machine washable and can be tumble dried. So go ahead sweat and get dirty in them. Click The Menu Links at the top to see the full line of products. Thank You for visiting Rogue Denim! For you vegans out there, now you too can have fun looking butch and know a cow didn't have to give his hide to show off yours! Above are examples of White and Black denim harnesses.